Just like every Sunday morning, Mark and I lay in bed, being woken up by first light. Last night, we had dinner on a friend’s boat and today, we’d like to sleep in. 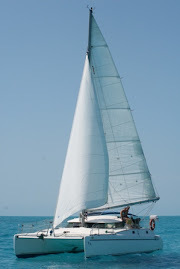 The radar cable in the mast is rattling and the bed is rocking with the constant wake created by speeding power boats. A fisherman buzzes by to check his traps nearby Irie. A plane noisily takes off from the airport. It is not even 7am. We keep our eyes closed, try to ignore the persistent hum of mosquitoes, try to find a dry spot on the sheets that’s not soaked with our sweat. The sun penetrates the window and beams onto our faces. More sweat trickles down on the pillows. It is 7:30am and time to get up! Another day in “paradise”! Instead of hanging out in the cockpit all afternoon, we decide to take a long trip with the dinghy and check out Cupecoy Beach. The weather is not very nice, but a dip in the clear ocean will do us good. All the way on the west side of Simpson Bay Lagoon is Porto Cupecoy, a fancy marina and shopping center. I immediately wish we could stay here and use the pool in its tropical and lush surroundings. A short walk across the street brings us to Cupecoy, a beach we have never checked out in those three seasons we spent in St. Maarten. Surrounded by nudists, we find our own little spot of sand and go for a swim. Later we explore the area a bit. It is indeed a very nice and un-touristy coastline, with little beaches tucked away into the cliffs. Locals and westerners alike enjoy their Sunday afternoon in one or another sandy cove, with or without clothes. When we have enough of it, Mark and I return home, watch the planes take off, yell at the speeding pleasure boats just missing ours, get annoyed by the huge wake created by multiple weekend ferries, frown upon all those loud jetskis resembling irritating mosquitoes, are engulfed by the humidity and wish it were Monday! Bye Bye St. Martin, Hello Martinique!